Dr. Gregory Skomal is an accomplished marine biologist, underwater explorer, photographer, aquarist, and author. He has been a senior fisheries biologist with Massachusetts Marine Fisheries since 1987 and currently heads up the Massachusetts Shark Research Program (MSRP). He is also adjunct faculty at the University of Massachusetts School of Marine Science and Technology in New Bedford, MA, and an adjunct scientist at the Woods Hole Oceanographic Institution in Woods Hole, MA. He holds a master’s degree from the University of Rhode Island and a Ph.D. from Boston University. Through the MSRP, Greg has been actively involved in the study of life history, ecology, and physiology of sharks. His shark research has spanned multiple fish habitats around the globe taking him from the frigid waters of the Arctic Circle to coral reefs in the tropical Central Pacific. 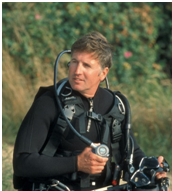 Much of his current research centers on the use of acoustic telemetry and satellite-based technology to study the post-release survivorship, ecology, and behavior of sharks. He has written dozens of scientific research papers and has appeared in a number of film and television documentaries, including programs for National Geographic, Discovery Channel, ESPN, and numerous television networks. His most recent book, The Shark Handbook, is a must read for all shark enthusiasts.